Why Disability And Poverty Still Go Hand In Hand 25 Years After Landmark Law : Shots - Health News Disabled Americans are twice as likely to be poor as those without disabilities. They continue to face many financial and physical barriers, despite the Americans with Disabilities Act of 1990. 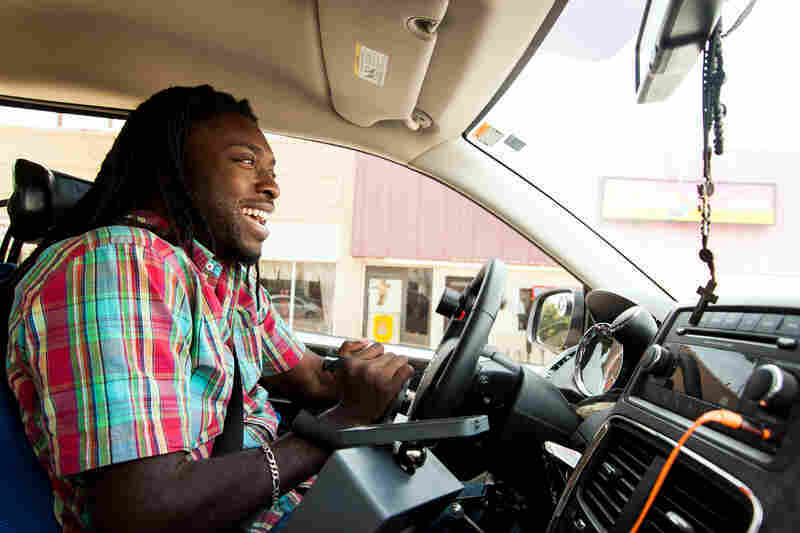 Emeka Nnaka, who uses a wheelchair, drives his new accessible van to meet a friend in Tulsa, Okla. The van allows the 27-year-old greater independence, making it easier to get to school and work and to have a social life. 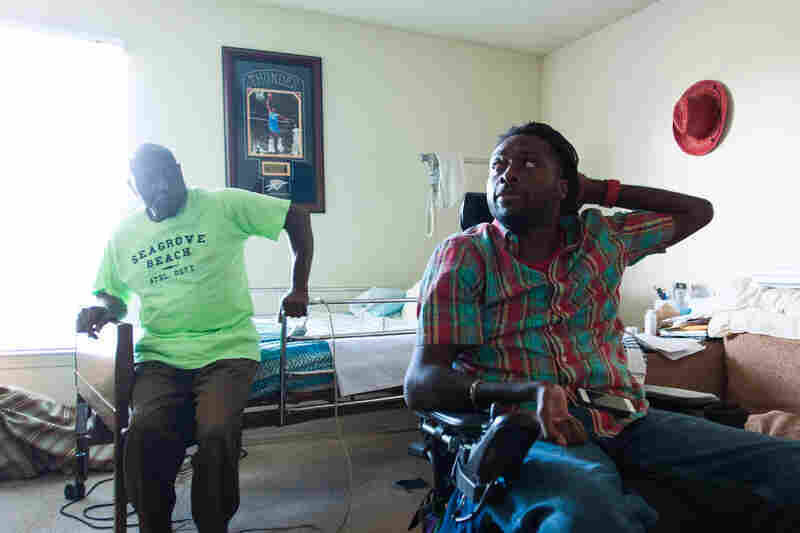 Six years ago, Nnaka, then a semipro football player, broke his neck during a tackle and was paralyzed. 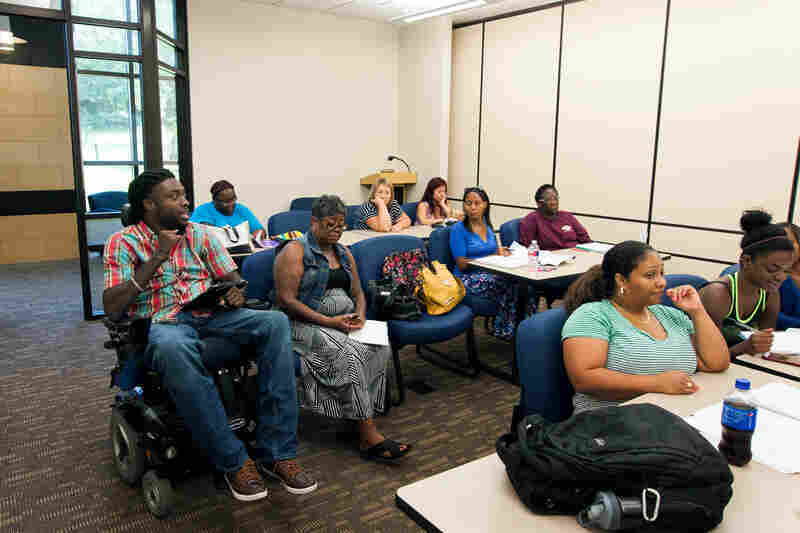 Nnaka has a discussion with fellow students during a class at Langston University's Tulsa campus. 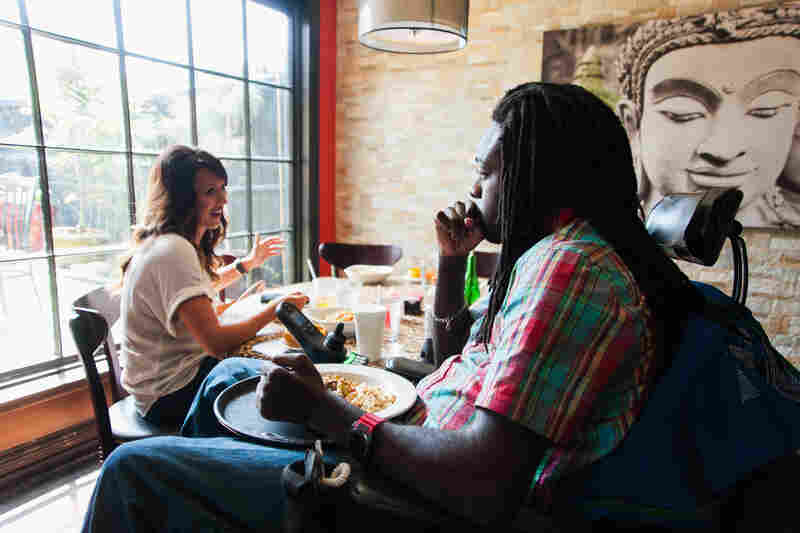 During lunch with his friend Jacquelyn Croudy, Nnaka asks the server for a tray so that he can keep his food in his lap; he says that's easier than trying to get his legs under the table. Nnaka runs into his friend Aaron Million in the parking lot of Tulsa's Center for Individuals with Physical Challenges. Just as Nnaka gets ready for his daily workout at the center, visitors show up for a tour. He volunteers to show them the gym and other facilities. Nnaka prepares to get into a "stander." 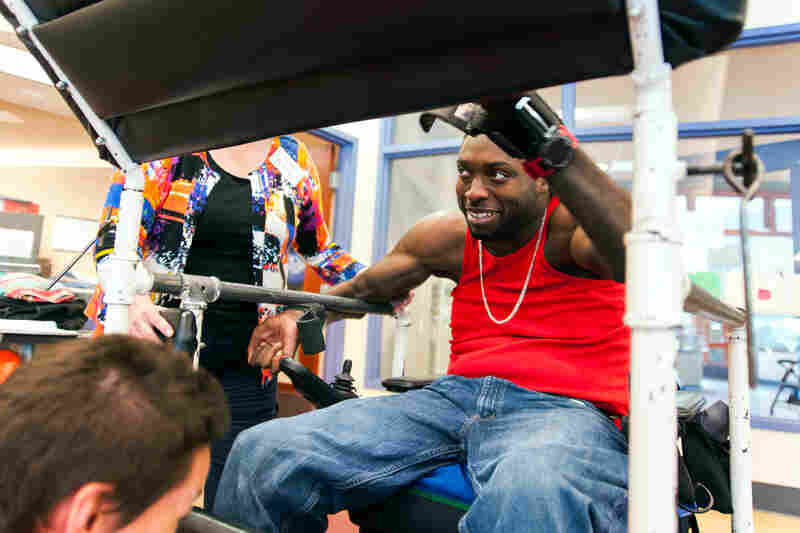 The device puts him into a standing position, which allows him to bear weight during his workout. 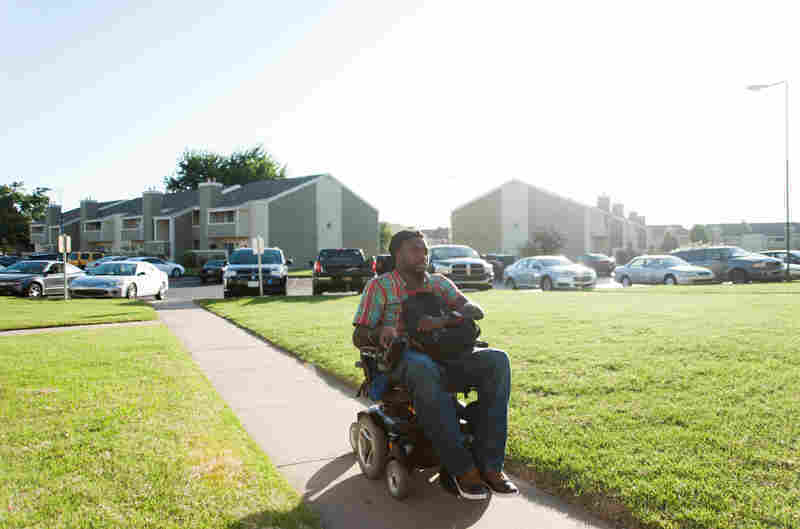 Nnaka arrives home to his apartment in South Tulsa after a long day. 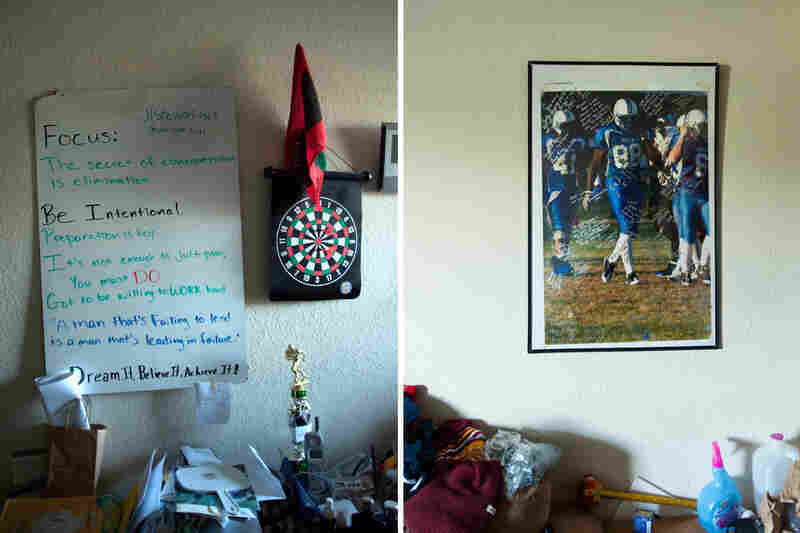 At left, a poster on the wall in Nnaka's room with inspirational messages. At right, a photograph taken moments before the accident that would change his life, decorated with signatures and messages from his Oklahoma Thunder teammates and friends. Nnaka and his father, Phillip, chat in Emeka's room. But it hasn't always worked that way, especially when it comes to expanding economic opportunity for the 58 million Americans with physical and mental disabilities. You just have to look at what 27-year-old Emeka Nnaka of Tulsa, Okla., goes through on an average day to understand some of the reasons why. Six years ago, Nnaka was playing semipro football for the Oklahoma Thunder when he went to make a tackle and broke his neck. 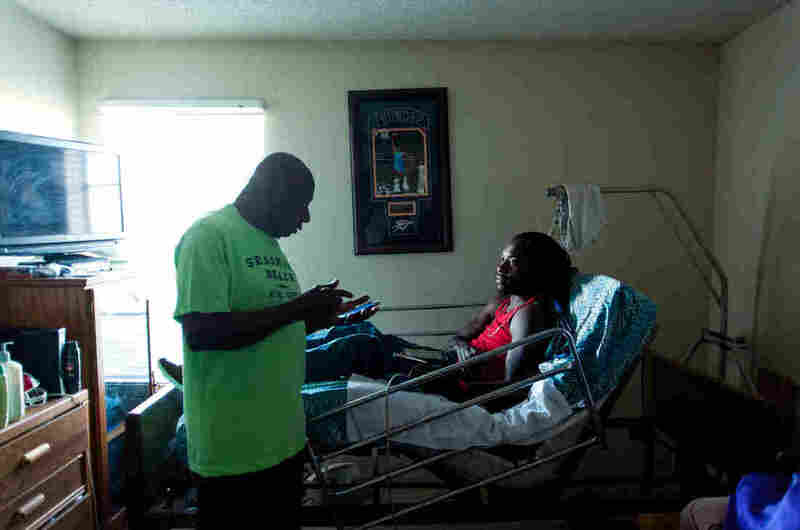 "I remember players saying, 'Meka ... you gotta get up. Let's go.' And I remember telling them, 'Give me a second,' " recalls Nnaka. "And one second turned to two seconds turned to three seconds." He was paralyzed from his chest down. 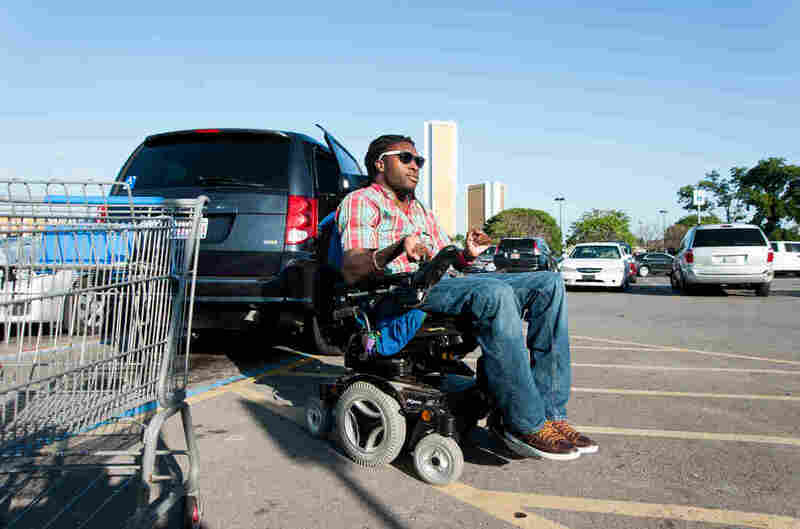 Today, Nnaka gets around in a motorized wheelchair, and has limited use of his hands. But he still has big dreams. He plans to finish his undergraduate education this summer and start working on a master's degree in human relations. He wants to become a licensed counselor, and hopes someday to have a home and a family he can support. 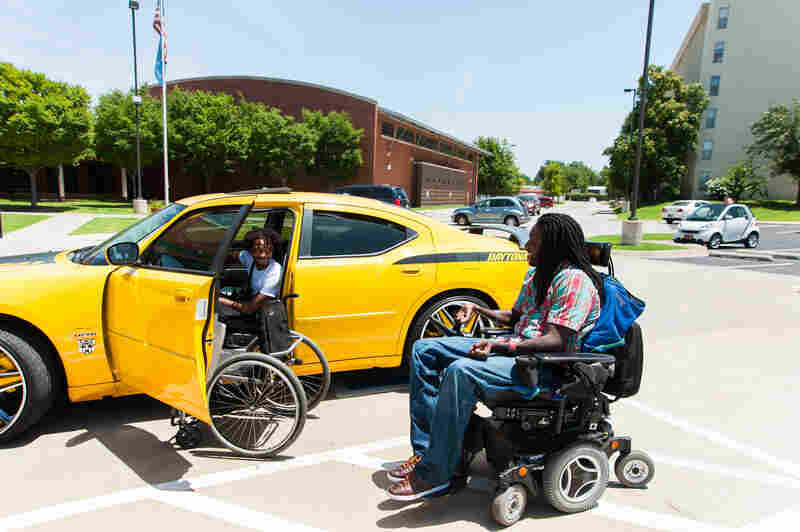 One key to his success could be the new accessible van he received in December with help from the Oklahoma Department of Rehabilitation Services and a group of friends, who held an online fundraising campaign for him, #MakeMekaMobile. Before the van, Nnaka had to rely on a special lift service provided by the city to get around. But those rides had to be booked at least a day in advance, and often involved long waits and complicated schedules. "I'd spend about three hours in transportation daily when I was riding the lift. So think about three hours out of your day in which you're not doing anything," he says. As a result, it was extremely difficult to get anything done. Without the van, Nnaka says, it would have taken him all day to run an errand he recently did in about an hour and a half: going to a staffing agency to fill out paperwork for a job. 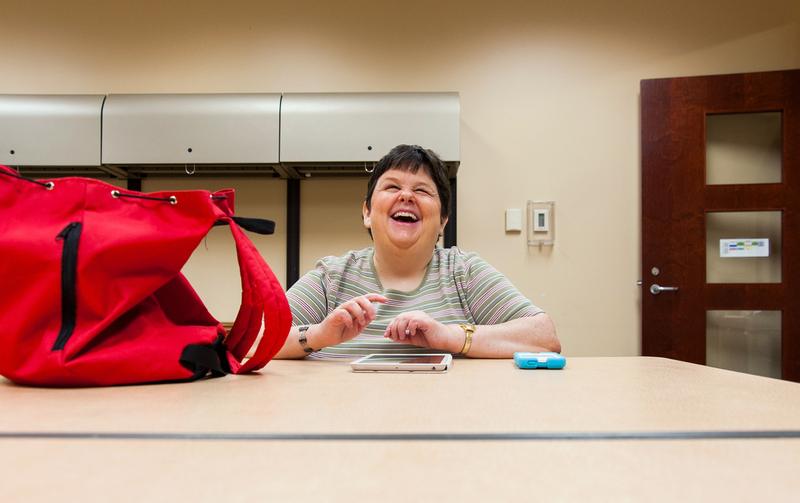 Just having a job is highly unusual for someone with a disability. Fewer than 1 in 5 disabled adults are employed, one reason so many are poor. The local United Way has hired Nnaka for a part-time position to talk about the group's work with programs for disabled individuals, including at the Center for Individuals with Physical Challenges, where Nnaka volunteers. But when he got to the staffing agency, he ran into a number of challenges that those with disabilities often face. Subminimum Wages For The Disabled: Godsend Or Exploitation? The problems started outside the building, where the strip next to the handicapped space where he parked was too narrow for the ramp he uses to unload his wheelchair. He had to park over the line on the other side to get out. He says if another vehicle had been parked in the adjoining space, he would have been stuck. And when Nnaka wheeled up to the front door, he found that there was no button to push to open it automatically. The building was constructed before the ADA, and while ADA standards highly recommend automation of exterior doors, it's not required. He had to wedge the side of one arm under the handle, cracking the door open slightly. He then wiggled his chair back and forth like a crowbar to get in. When Nnaka got into the tiny elevator, he couldn't turn his chair around to reach the buttons. Fortunately, there was another passenger to help. Once inside the staffing agency, he had to move the computer mouse slowly with a clenched fist to fill out nine pages of forms. This former athlete seems to struggle through even the smallest task. Still, Nnaka hopes to show employers that it's worth hiring him and others who face similar challenges, that they have a lot to offer. He says one problem facing people with disabilities is that many companies think they're not up to the job, or think hiring them is not worth the effort. And there is a vigorous debate over why so many individuals with disabilities are unemployed. 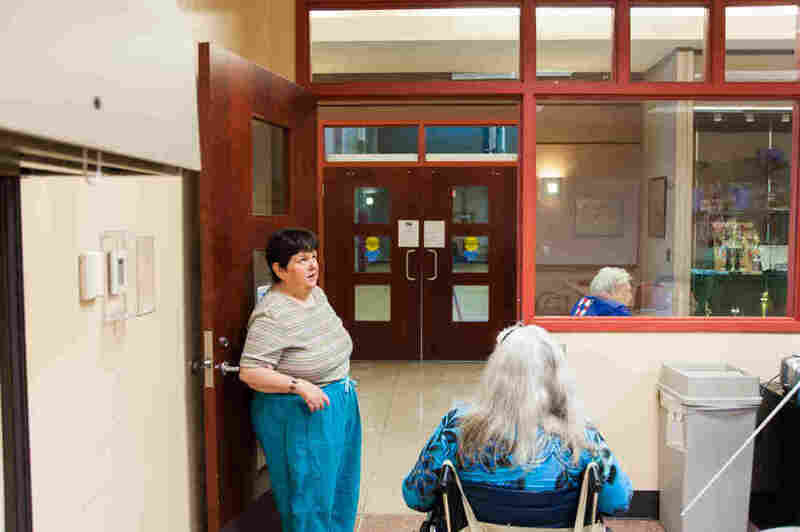 According to the Employment and Disability Institute at Cornell University, 28.4 percent of disabled adults worked in 1990, compared with 14.4 percent in 2013. Debbie Eagle, who's been blind since birth, is one of Nnaka's colleagues at the Center for Individuals with Physical Challenges. She volunteers there, teaching the visually impaired how to use technology. Debbie Eagle, a 43-year-old who has been blind since birth, says she can't find work, even though she has a bachelor's degree in special education. She volunteers at the Center for Individuals with Physical Challenges in Tulsa. She says she'd really like if either she or her husband — who is also visually impaired — could find a well-paying job so that they are "not dependent on the government." But try as she might, the 43-year-old says, she can't seem to find work, even though she has a bachelor's degree in special education. Eagle blames employer ignorance — as well as the Americans with Disabilities Act. "Employers are scared to hire us," says Eagle, "because they don't know what kind of accommodations we require. And if they don't meet what we consider to be reasonable accommodations, they're afraid we'll sue them." Eagle says she can't prove that this is the reason, but she's pretty sure it is. Michael Morris, executive director of the National Disability Institute in Washington, D.C., agrees that some employers are hesitant to hire people with disabilities. "Attitudes change slowly," he says, adding that he doesn't think there's a single reason for the gap between the employment rate for those with disabilities and those without. Morris says a lack of accessible transportation is one big problem for disabled individuals trying to work or go to school. And he says that students with disabilities are less likely to graduate from high school and college, putting them at a disadvantage in a competitive workplace. He says another obstacle to employment is that if recipients of federal disability payments save more than $2,000, they risk losing their benefits, including medical care. "The decision becomes, 'Wow, I think I'm going to just stay put where I am.' Which is the equivalent of a life sentence of poverty," Morris says. In fact, that asset limit was a big problem for Nnaka when donations began pouring in for his new van. At one point, he says, he kept $4,000 in cash in the closet of the small apartment he shares with his father. If he had put the money in the bank, he could have lost the $700 monthly disability check he needs to survive. The irony, he says, is that the money was earmarked for buying a van that he would use to go to school and get a job — making him less reliant on government aid. "The system is not set up to succeed," Nnaka says. Morris says the outlook is improving, though. Congress recently passed a law that will soon allow some disabled adults to save more money by establishing special accounts — exempt from the cap — in which certain savings can be placed. Federal contractors are also required to set goals for hiring more disabled workers. And Morris says a growing number of students with disabilities are earning degrees and getting internships. "That actual experience does more to change attitudes, change perception, right through to their HR offices that say, 'Wow, hidden talent pool. Let's explore it,' " says Morris. He thinks, though, that it could take another 25 years before the promise of economic independence envisioned by the ADA is achieved. Nnaka agrees that many doors have been opened since the law was enacted, but he says it hasn't been enough. "There's so much more that people with disabilities need, to be inclusive and included in this society. To have just the same opportunity that anybody else has," he says. Unfortunately, he adds, the ADA has led many people to believe that all the barriers are gone.